Have I left you in suppense long enough??? I was hesitant even showing this picture! The room is FAR from finished and I don't want you to judge based off of this picture, but I know you have been waiting so long.... sooooo here it is!!! OK, lets back track a bit, here is just a snap shot of ALL the many things I WANT and NEED to change about the room. Some will come quick and others will take time! I also desperately need curtains, and also start the process of re-upholstered my over sized chairs in a pretty burlap type fabric. I also want to add nail heads to the chairs for some extra drama. BTW does anyone know someone really good in my neck of the woods that re-upholsters?? I am also looking for a NEW entrance light, so any suggestion in that area is much needed! 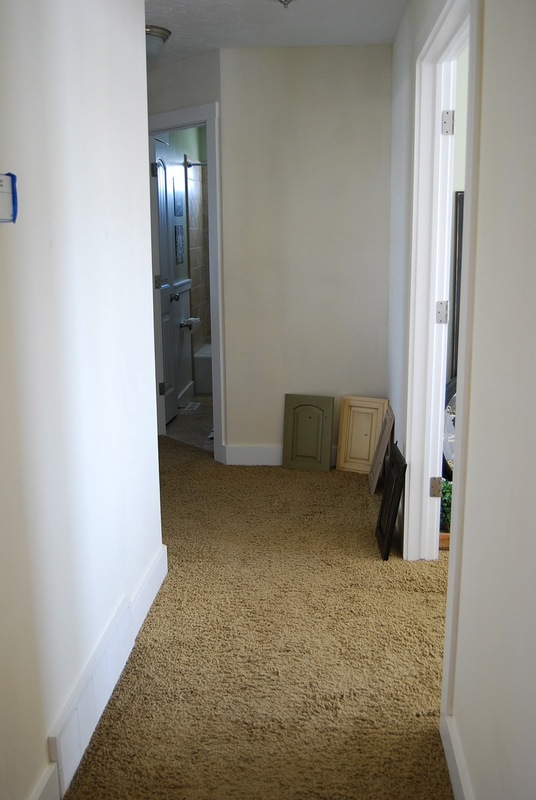 Here is a quick before picture! WOW...much improvement!! In the meantime, the white Martha Stewart chairs are there for inspiration until I can switch them out. Eventually they will work their way into the kitchen..but that's an Entirely different project that I will have to update you later on! Here is the picture of the hall...I am LOVING the trim, but now I need to add some MAJOR color!!! I have a few ideas up my sleeve, BTW taking pictures of Halls is NO easy task, This shot looks soooo much better in person than in this picture! It's Not perfect but it's a start, I am in the process of deciding on a MAIN ROOM color and looking into adding a bit more accent colors like warm gray hues to the room. for what it's worth - i think the changes look absolutely gorgeous! so bright and fresh. you have such a lovely eye for design. and for 'throwing a room together'- i'm in awe! Personally I really like the smaller chairs, it helps balance all the big items in the room. Just my opinion though. :) Everything looks like it's coming along GREAT! That looks great! 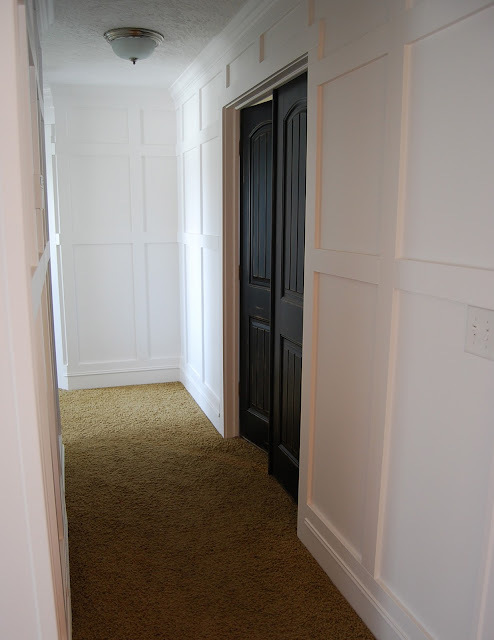 I would be fascinated to know how you guys figured out how to space the trim in the hall. Does each wall have slightly different spacing or did you have to do some crazy equation crap to figure out how to space it just right and symmetrical all the way down? Your room is beautiful! I love the white and blue...it looks so fresh and clean. Great job. Thanks for sharing! 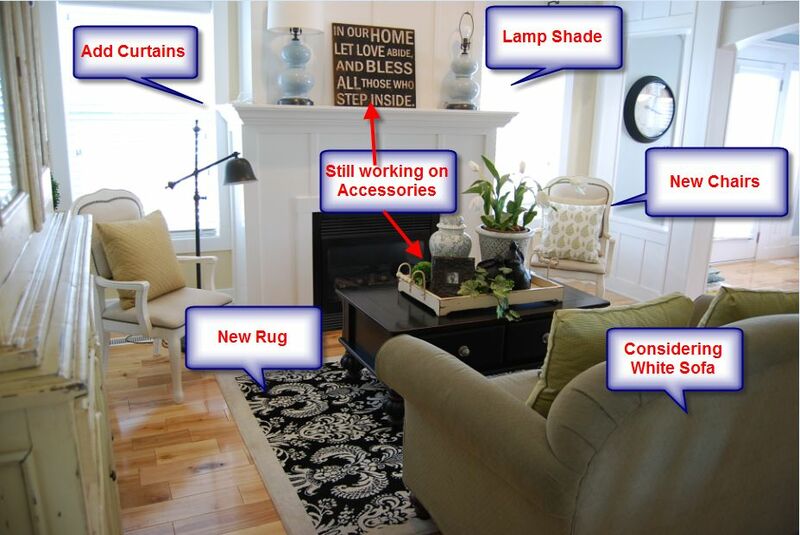 I love the paint color in your family room. Would you mind sharing what the color is? I'm getting ready to pain over my green and am looking for a lighter color and I think it looks great. Everything looks wonderful....the before AND the afters! Your trimmed up halls are AMAZING! Don't think I've ever been in a house with a hall that made me drool. I completely know your pain about the decor. stores being soooo far away. We have that now too, but not quite as big of a drive. I used to visit teach a lady in IF that had amazing decor and finally I just asked her wear she shopped and she said Tai Pan and Gardner's Village. So your next trip to Salt Lake we checked them out. My sisters and I couldn't believe there were stores like that out there! And why weren't they in Idaho?! Yes, I miss Tai Pan and Gardner's really REALLY badly (they are now over 2,000 miles away) but planning stops to both places in less than two weeks! As far as your lamp shade goes, I will be flying into Salt Lake and visiting family in IF for a week... and I need an excuse to meet you and/or at least see the outside of your house! Let me know if you need us to pick up the right shade for you! I love what you've done so far. Never gave trim work much thought, but wow - it makes such a difference! Wow! I love everything you have done! 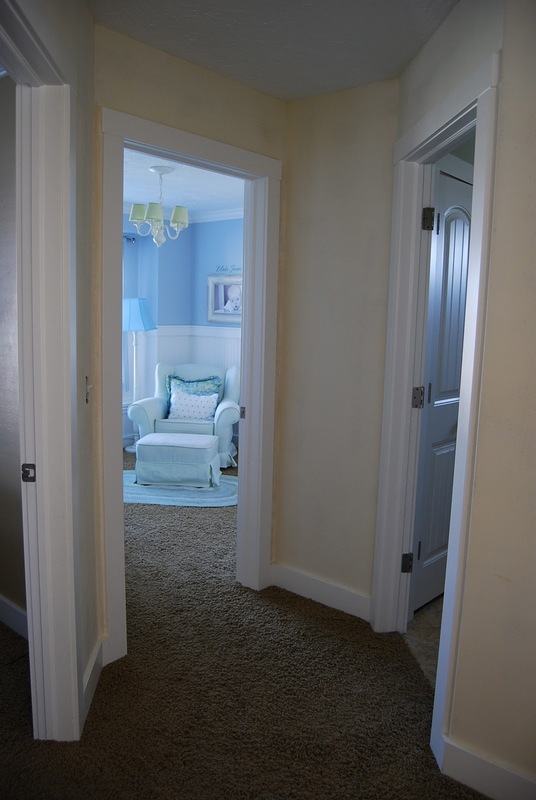 All the trim work is stunning and adds so much interest. Love it! 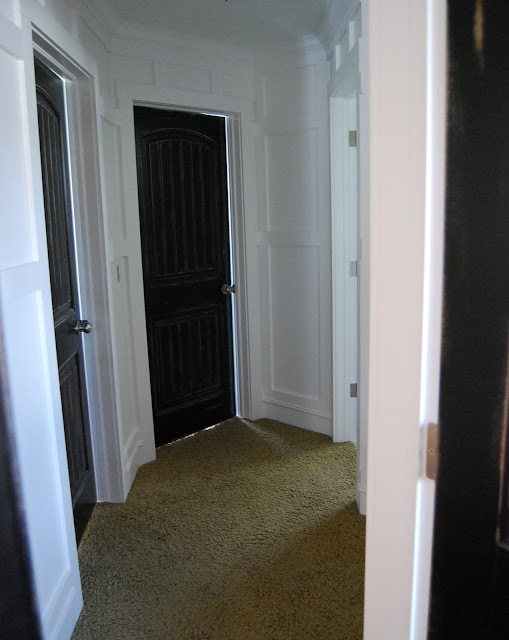 I would never in a million years thought to paint the doors black & take the molding to the ceiling, but both of those decisions look BEAUTIFUL, especially together! Just ran into your blog...so glad I did. Your house is absolutely beautiful! Thanks for sharing! I love it. Everything you do is gorgous Heidi! I do have a crazy question- where did you get the large red check curtains in your "old" living room? I'm looking for some like that! I wish I had the energy & creativity you do! Looks great Heidi! I'll be watching what you do with your windows... I need window coverings desperately and I think I can take inspiration from your Hampton style. I love your room it looks so fresh and bright. I really want your fire surround, so much so that I've pinned it to Pinterest so I can wave it in my husband's face as another project on his list! Wonderful job! Thanks for the peek! I love it, I am just wondering what the heck you do in that little room...I don't see a tv? BTW, I have the same coffee table and end tables and I have been dying to paint them white...you first, pretty please??? Looks absolutely gorgeous, I love how fresh and airy it looks, although I loved your before too! It shows what good taste you have!! I just read your WHOLE BLOG. Literally. I love it. Your home is absolutely gorgeous and I've pinned tons of your moulding work. Thanks for showing us all your house eye candy! What a stroke of luck to stumble upon your blog, you have a fantastic eye and I fully intend to copy cat a lot of your great ideas! One question, talk to me about the painted china hutch in your LR, did you do that yourself? Is it chalk paint? The molding is to die.for. and I just ordered a nail gun to get busy on my own projects. Thanks for the inspiration. My hutch is from a company called Bramble and Co. The hutch came painted that way. I picked it up a few years from a local shop here in Idaho. Good luck with all your projects!